GlacialTech reveals the Igloo 5620, a new line of budget processor coolers with two 6mm direct-touch heatpipes, aluminium fins and a 92mm ultra entering bearing fan. There are two different versions, the Igloo 5620 Silent has a 1200RPM fan with an airflow of 34CFM and noise level of 20dBA, while the Igloo 5620 PWM offers 800-2300RPM with a max airflow of 43CFM and max noise level of 30dBA. The cooler measures 100mm x 62mm x 135mm (W x L x H) and weighs 320g. Intel's LGA775/1155/1156/1366 and AMD's FM1, AM2, AM2+ and AM3 platforms are supported. 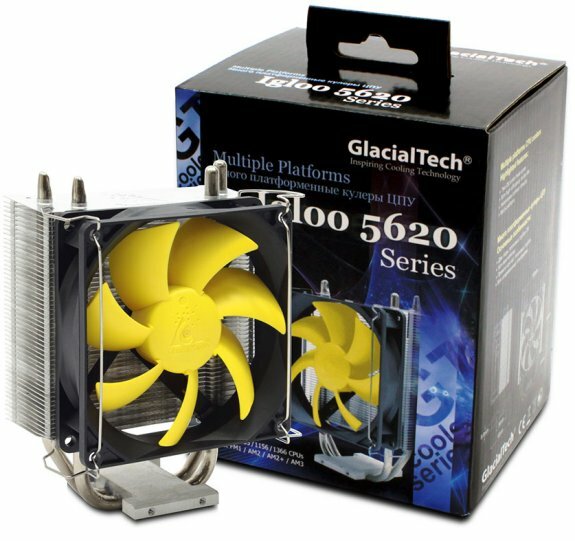 GlacialTech has just come to your rescue with the Igloo 5620 series CPU coolers. The Igloo 5620 series consists of heat pipe cooler which belong to mainstream level and offers a powerful modular base for your ultimate CPU Cooling solution. The Igloo 5620 series can run at incredibly low noise; thanks to its High Fin Density and it’s massive fin surface area. Or you can add 92 x 92 x 25 mm fan to boost the air through put and improve its cooling performance even further. Igloo 5620 is a simple name for a promising product, the unique CPU cooler series from GlacialTech. The GlacialTech engineers have created a high-performance product. They focused especially on the optimisation of the air stream conduction inside the heat sink to reach more efficient heat dissipation. The result is a combination of smart innovations that successfully reduce the thermal resistance of the Igloo 5620 - a new milestone in CPU cooler industry. The coolers offer an excellent price-performance ratio and are equipped with a durable and silent fan. Compact, high-performance CPU Cooler maximizes CPU efficiency with aggressive heat dissipation and eliminates noise with expertly engineered fan blades. Price performance, noise performance and weight performance are GlacialTech's three principle design philosophies. Having acquired ISO 9001 and 14001, GlacialTech commits itself to use green materials for its product design and construction and to manufacture its products following green manufacturing processes only. As a total thermal solution provider, GlacialTech is committed to bring increased value to customers through the creation of light weight cost effective systems, and a quiet working environment with an optimal price performance benefit. The Igloo 5620 Series are for your PC evolution to an ultimate light weight, low cost CPU cooler for your system.